Using mail order genetic ingredients, researchers recreated an virus similar to deadly smallpox. 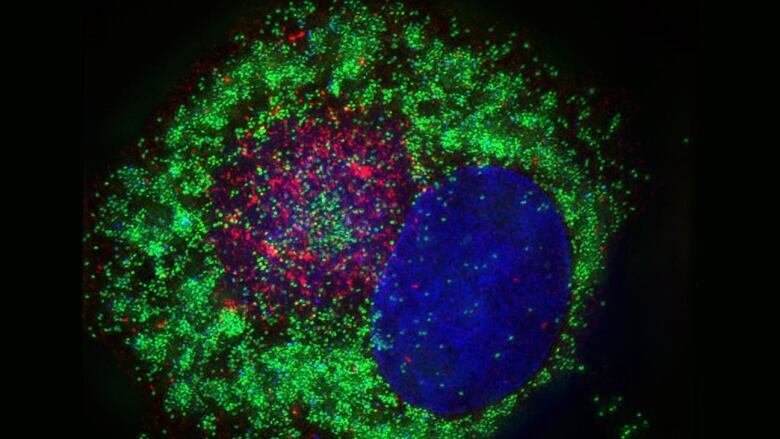 Using genetic ingredients ordered from a medical supplier and an increasingly accessible lab tool, scientists have recreated the horsepox virus, which is closely linked to the deadly smallpox virus. Dr. David Evans of the University of Alberta in Edmonton was the lead researcher on the project. His lab was aiming to prove that exposure to a different pox — cowpox — was the source of the immunity to smallpox and the key to the smallpox vaccine. So some worry that his lab has created a blueprint for the use of this technology to a dangerous end. Here's part of Bob McDonald's conversation with Evans. Bob McDonald: Well walk me through what you did. You wanted to make horsepox. Where did you get the ingredients? Dr. David Evans: We were able to take a sequence from horsepox and we used that sequence to design and then order some large DNA clones from occurs commercial company and then we assemble those clones into an infectious virus using a helper virus system. You just call up a company and say I need some DNA? I mean first of all they want to know who you are and what you're doing with it. And of course it's not trivial to design the clones when we had to tell them exactly what sequences we want and we also had to order some very special bits as it were because the virus had some unusual genome features that needed to be copied. Is this something anyone could do? There are these people called bio-hackers, mostly in the U.S., who do contact these companies and they can order certain DNA sequences. But all the reputable companies will take the sequence that you're ordering and run it through computers to figure out what it is you're doing. So for example horsepox is considered a Level 2 agent and that would be usable. But if you were to try and order any of the really dangerous viruses, Ebola or things like that, they would ask questions and might well call CSIS. Were you successful in assembling an actual horsepox? Some scientists have expressed concerns about your work because the same process you used to create the horsepox could be adapted to bring back the deadly smallpox virus. Why do you believe that what you did was safe and ethical? Well you're absolutely right. I mean this is called dual use research as we have explained to everyone all along. If you can make a horsepox, you could theoretically make a smallpox. The technical challenge is to get the DNA for the smallpox, which certainly none of the DNA synthesis companies would ever make, but this would not prevent a country with resources from doing it …Yes, the negative side of the equation is that you could remake variola (smallpox) virus. But the positive side of the equation is that you have … the medical applications of viruses. So, for example, I work both in the area of vaccines and in the area of oncolytic viruses. Oncolytic viruses are a technology that's being developed particularly in Canada to try and treat and kill cancers using viruses. In order to advance that technology we have to go beyond the ability to just tinker and tweak the viruses. We need to have the capacity to really re-engineer them so that we can get both a killing response and a stimulatory immune response. That's a very complicated demand. And the current technologies that we've been using for the last 30 years won't do it.